A Commercial Freighter is a solar-powered private ship with many large cargo containers. This ship is guarded by three Gatling turrets. 1 Turret on the front center. 1 Turret on each side. As of 01.045 1 Interior Turret inside the cockpit room. The specific antenna that spawns drones has a range of 396 meters and is named: "EMERGENCY - REQUESTING ASSISTANCE". This antenna within range will spawn a Assailant drone in defense, at 3000 meters away from the player and every 5 minutes up to a total number of 3 drones active any time. As of v.1.030 (list), the Gatling Turrets and Missile Turrets are functioning and will shoot you once within 600 meters in range. Best tactic is, so far, to use several decoys (can be real Decoy or any block with a computer component) to distract the turrets. The approach vector with the least turret coverage is from below and behind. One of the two small reactors is located at the forward connection point of the left hull. The other one is deeply buried in the right half of the ship. Also each side contains multiple batteries near the top. On the outside are two collectors and small reactor in the front. Entry is obtained via a door in the rear of the module, which gives you access to three large cargo containers and two incompleted assemblers. This module has two levels. Entry to the "ground" floor is obtained via a door at the rear. It gives access to three Large cargo containers (one is incompleted) and a small reactor. Toward the front of the ship, there is a small vertical shaft made with passage blocks leading to the second level. Here is the ship's cockpit and also one small cargo container. Behind this container are two gyroscopes and a Gravity generator located. 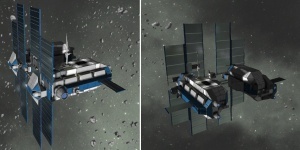 Each of the five large cargo containers are interconnected and can be plundered even from the outside (via the small reactor in front of the left hull). 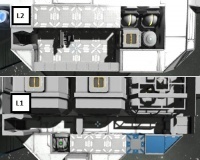 The small cargo container in the right hull has to be raided separately, since its is not connected to anything else. As of v.1.030 (list), the game changes are most noticeable on the new Commercial Freighter. The prominent conveyor tubes, the collectors at the sides and Connector sticking out at the front distinguish the new version. The ship has lost its booby traps and one of its turrets, but gained one additional reactor. This page was last modified on 10 July 2018, at 05:32.